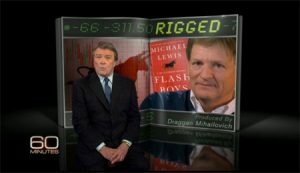 A few weeks ago on 60 minutes Steve Kroft interviewed Michael Lewis the author of the new book “Flash Boys” which explains how rapid trades happening in a fraction of a second are responsible for stripping billions of dollars out of the US stock market. These trades that happen 100 times faster than you can blink an eye are responsible for profits being taken not because the company made a profit by providing good services or products, but because huge computers with advanced algorithms are able to intercept orders, as they are being placed and basically cut in line to execute the order. They have a name for this process when it is done on paper, it is called Front Running and it is illegal. Apparently if it is done in a computer model under todays laws it is not only, not illegal, it is common practice. In the interview one hedge fund manager states that this practice cost one of his funds in excess of $300 million dollars in 2013. The question you have to ask yourself is if my retirement plan is invested in that hedge fund how much did that cost me in my retirement plan. These trades take place so fast that they cannot be seen by the human eye and in most cases cannot even be recorded by the market itself. So exactly how does this happen. Think of it this way. You want to go to a show and you look online and see 4 tickets together available at $25 per seat. You place your order and then the computer comes back and says that you were successful in purchasing 2 of the tickets for $25 but that now the other two tickets are $30. You have no choice but to complete the order, you own 2 tickets but need 4, this is front-running. Are you ready to take back control of your retirement and your future? Are you ready to know that every year you will earn a profit and eliminate the risk associated with “Being In The Market”? If the answer is yes then you can join thousands of people just like you that have learned how to Bank on their Family and create Financial Certainty. We would encourage you to join us for one of our webinars or events where we will explain how you can Harness The Power of Banking.